It’s rich and complex, not your average tomato jam. The cinnamon and cloves spice it up, but the ruby port makes all the difference between an average jam and a memorable jam. It’s good by itself on toast, crackers, or baguette slices, and even better with sheep or goat cheese. The recipe comes from the newly released The New Portuguese Table (review) by award-winning author David Leite, a book combining culinary tradition with modern flavors. 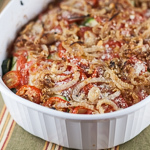 In his version, Leite reduced the sugar considerably, leaving plenty of room for the flavor of the tomatoes to shine. We used our homegrown Cherokee Purple tomatoes, a rich rose-purple colored heirloom. We had several of them ripen at once, giving us the perfect opportunity to try them in this jam. The tomatoes have a sweet, rich flavor that works perfectly with the spices and port. I’m delighted to announce the second anniversary of Grow Your Own, a blogging event that celebrates the dishes we create from foods we’ve grown, raised, foraged, or hunted ourselves. Two years ago I was searching for a food blogging event with a grow-your-own theme but couldn’t find one, so I said, “Why not?” and announced a new food event. I’ve been thrilled to meet bloggers through Grow Your Own and learn about the things you grow, forage, hunt, and raise. My thanks to all who have supported the event by participating, hosting, or spreading the word. If you would like to join us for the fun, please send your post information to andreasrecipesgyo AT gmail DOT com by midnight EST August 30. If this is your first time participating, welcome! You can read more about the rules for participating at the Grow Your Own page. 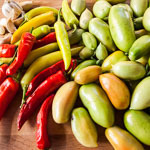 You don’t need a big garden or farm to participate, even a few herbs in a pot or foods you foraged, hunted, or raised qualifies for Grow Your Own. And because people who garden, farm, forage, or hunt often share the bounty, we also permit foods that were given to you from the source. Of course if you would like to host an upcoming GYO event, please send me an email. Adapted from The New Portuguese Table, by David Leite (review). Combine the tomatoes and any accumulated juice, the sugar, cinnamon, zest, cloves, and port in the 4-quart saucepan. Bring to a boil over high heat, skimming any foam that accumulates on top. Lower heat to medium-low and simmer, stirring occasionally. As the jam thickens, stir more frequently, at least 1 hour. Test the jam to see if it’s ready to can. Put a small plate in the freezer for about 10 minutes, then dollop a spoonful of jam on top and put in the refrigerator for 2 minutes. It it gels, you are ready to can. While the jam cooks, sterilize the jars, rings, and lids. In the canning pot, add enough water to cover the canning jars by at least 2 inches. Bring to a boil and immerse the jars and the metal bands. Ladle some of the boiling water into a small bowl and put the lids in to soften the rubber. When the jam is ready, remove from heat and discard the cinnamon stick, cloves, and lemon zest. Using the jar lifter or tongs, remove the jars from the water, keeping the water boiling. Using the wide-mouth funnel, ladle the hot jam into the jars and leave 1/4-inch (6 mm) headroom. Wipe the rims clean with a wet cloth, place the lids on top, and screw on the bands until finger tight (not too tight). Lower the jars into the pot and make sure they are covered by at least 1 inch (2.5 cm) of water. Once the water returns to a boil, process for 5 minutes. Transfer the jars to a heat resistant surface (I use an old cutting board) and let cool completely. Listen for the “pop” to indicate the jars have sealed and check the lids to make sure they’re depressed. If the jar did not seal, keep it in the refrigerator and eat within 2 weeks. Properly processed jam will store for up to 1 year in a cool, dark place. Refrigerate after opening. You can use dry pectin to speed up the setting process, though the flavor will change somewhat because it only cooks for a few minutes instead of an hour. Add the dry pectin in Step 1 and bring to a full rolling boil over high heat, stirring constantly. Add the sugar, stir, and bring back to a hard boil. Boil it hard for 1 minute. Skim off the foam and proceed with canning. Wow Andrea, that flavor combination really does sound lovely! Wow, ruby port! What an exquisite addition. Love the color on it! Congrats on the Grow Your Own anniversary! That’s quite a milestone. I’ve been reading Leite’s site for quite awhile now. I was even a recipe tester at one point. I’m very excited for his cookbook, especially if the recipes are as beguiling as this jam. The color is exquisite! I love tomato jam on crostini and paired with grilled meats. Wish I had some for the grilled lamb chops I’m making tonight! So glad you enjoyed my jam, and I’m honored that you’re using the recipe as part of your Grow Your Own project. Now you have me wanting to make it all over again–even after making it a half dozen times. Oh, a tip: I sometimes squeeze 2 tablespoons of lemon into the pan. Gives it a nice spark of citrus. Thanks David, you are right, the lemon does add a nice little spark. I’ve tried this recipe, it’s absolutley lovely, I’ve had many types of tomato jam in Portugal, but this is the best!! muito muito obrigado. Oh that doce de tomate looks delicious, I had never heard of such a thing, Portugal has little surprises and I would love to visit there one day. The packaging is beautiful! I’ve never had tomato jam before, so I’m excited to try this recipe out! I love tomato jam, especially spread on toast with a bit of goat cheese. Yum. Your recipe sounds delish! What a lovely thing to do with extra tomatoes. My mother-in-law used to make yummy tomato jam with orange peel. I love the addition of port, so adult. Congrats on your GYO two year anniversary! 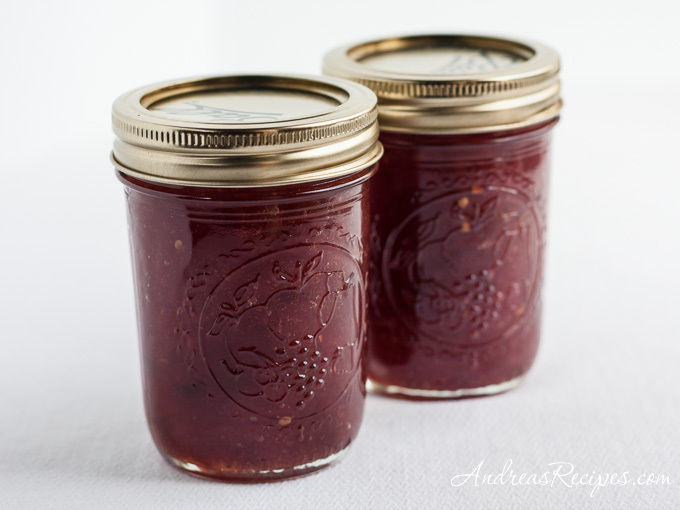 my aunt makes a terrible tomato jam–this one looks delicious and makes me want to try it. Hi – this looks delicious and I’ll try making it this weekend. A question though – do the tomatoes really need seeding? I would have thought the seeds made little or no difference to the jam, and cutting out the seeds takes out a lot of the juice. Hi Charlie. You are correct, seeding removes the juice. If tomatoes have excess juice the jam may not set properly, leaving it runny. This looks fabulous – my tomato plants are on major overload this year. You mentioned the excess juice issue – would it be ok to use a bit of pectin to help with that? It’s also a great reason to buy a good bottle of port! Thank you for this lovely recipe. Having grown my own toms for the first year ever, with seeds purchased in Italy – this is a great way to preserve some of my wonderful summer flavours into the colder winter months (just around the corner). Works fabulously with a rich pate, as well as a great side to cheese. Hi Ed. 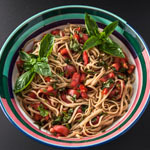 Yes, you can use dry pectin to make tomato jam in this recipe, though the flavor will be changed somewhat because the cooking time is greatly reduced. I will add some instructions this morning as a variation. I made your jam, was a little skeptical at first- but it is fabulous! Everyone who tries it loves it. Thankyou for the recipe, I think this is one I will make every year! 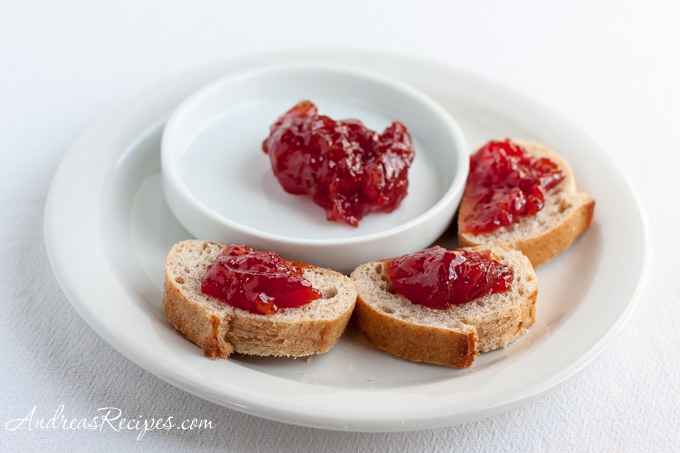 Made this jam, pretty good and quite candied….nothing close to tomato sauce or ketchup….took me by surprise. Not sure if the tomatoes are to be weighed first and then prepped for cooking. I lost about 1/3 of the mass in waste, I’m now wondering if the jam should have had a bit more tang/acid and less sweet.